I have worked for several businesses and, while they all had significant differences, one thing that they had in common was a heavy reliance on Microsoft Excel. The exact extent of this usage may have varied between these companies, but everyone in those businesses that was on a computer had at least some experience with trying to print a spreadsheet. Excel has changed a lot over the years, but one problem that still remains is that most spreadsheets are not formatted well for printing by default. While there is no magic secret that will automatically help you to print all of your spreadsheets perfectly, you can become familiar with all of the possible printing changes that you can apply to your spreadsheets so that they print better, and are easier for your audience to read. Below are some links that you can click to jump to a specific point in this article, if you have arrived on this page because you are trying to see how to perform one specific action. The header section of a spreadsheet in Excel 2013 is the very top of the page. Content that you place in the header will print at the top of every page. This is the spot where you might want to put the title of your spreadsheet. You could also choose to put a page number in this location. Click the Insert tab at the top of the window. Click the Header & Footer button in the Text section of the ribbon. Select one of the header regions, then type the information that you want to repeat at the top of the page. Gridlines (not to be confused with cell borders, which are very similar) are the lines that you see in Excel on your computer screen which physically separate the cells in your spreadsheet. But these gridlines don’t print by default, which can make it difficult to visually separate data on the page. Fortunately you can have Excel print these gridlines and make your sheet a little easier to read. Check the box to the left of Print under Gridlines in the Sheet Options section of the ribbon. Many spreadsheets will contain a row at the top of the sheet that identifies the information in each column. People reading that spreadsheet will then be able to tell the meaning of the data in each of the cells in that column. 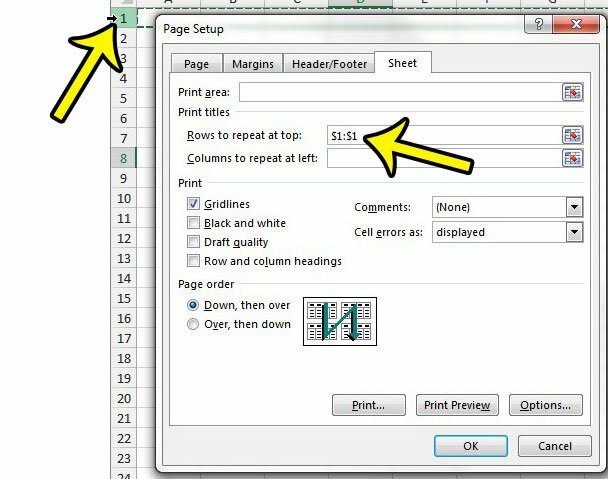 But if your printed sheet is more than one page, and that row isn’t repeating at the top of each additional page, then your readers might be trying to match up data to columns, which can create confusion. You may have tried to manually repeat this row in the past, but that can be very frustrating. Fortunately there is an option in Excel that will repeat this title row for you automatically. Click the Print Titles button in the Page Setup section of the ribbon. Click inside the Rows to repeat at top field, then click the row that you want to repeat. 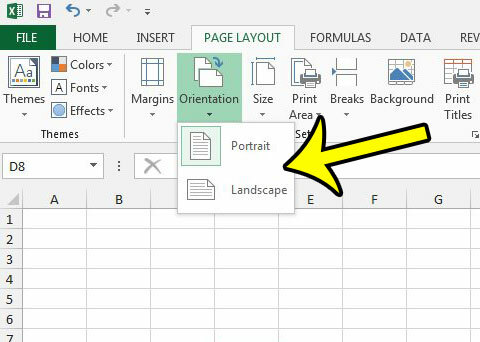 A spreadsheet that you print in Excel will automatically justify itself at the left side of the page, at the top. This is fine, and almost not even noticeable, when the spreadsheet is naturally filling the majority of the page. But a spreadsheet that only has a few columns might look odd when it is left-justified, or you might be using Excel to print something that you would like to locate at the center of the page. 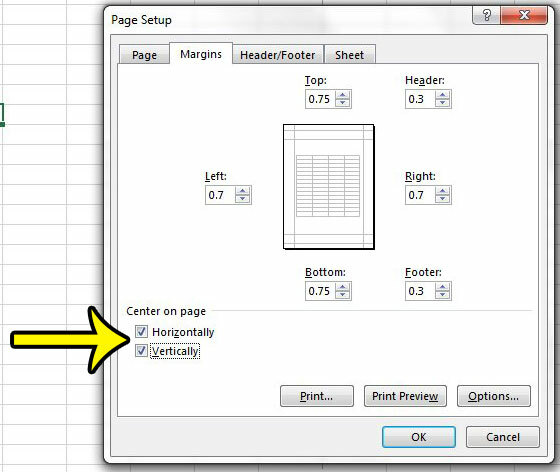 Fortunately you can elect to center the page either horizontally, vertically, or both in Excel 2013. Click the Print Titles button. Click the Margins tab at the top of the window. Check the box to the left of Horizontally and/or Vertically under the Center on page section. 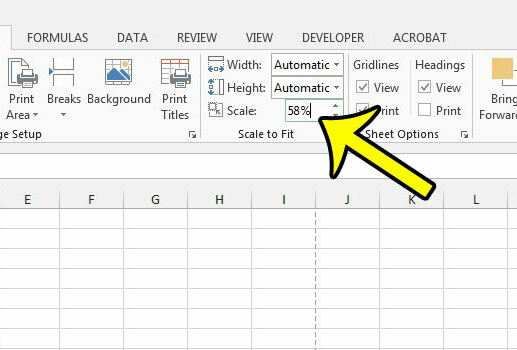 Manually adjusting the row heights or column widths of the cells in your spreadsheet in order to fit your data on one page can be a nightmare. You typically do this when Excel is doubling the number of pages that it prints because of one or two columns that are printing on their own page. 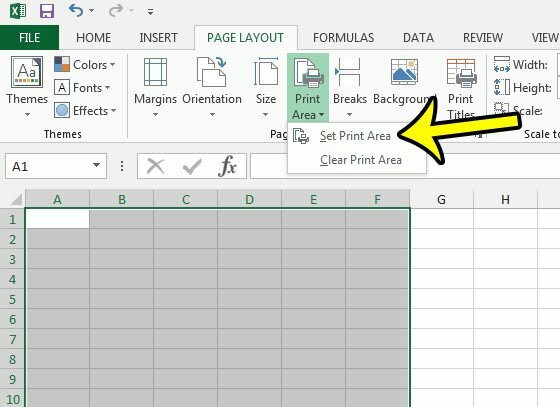 There is actually a place on the Print menu, however, where you can tell Excel to automatically fit either all of your rows, all of your columns, or even the entire spreadsheet onto one page. Click the File tab at the top-left of the window. Click the Print button in the left column. Click the No Scaling button under Settings, then click either Fit Sheet on One Page, Fit All Columns on One Page, or Fit All Rows on One Page. Your spreadsheets probably print in portrait orientation by default, but this is impractical for spreadsheets that have a lot of columns. Changing the orientation to landscape will reduce the number of rows that fit on a page, but increase the number of columns. The correct orientation is a judgment call based upon the “shape” of your spreadsheet, but you can often improve a printed Excel file by switching orientations. Click the Orientation button in the Page Setup section of the ribbon, then choose either Portrait or Landscape. Previously we discussed using an option on the Print menu to force columns or rows to all print on one page, but you can still choose to manually scale your spreadsheet, if you prefer. Click inside the field to the right of Scale in the Scale to Fit section, then adjust the amount. Anything below 100 will reduce the size of the current sheet, while anything above 100 will increase it. 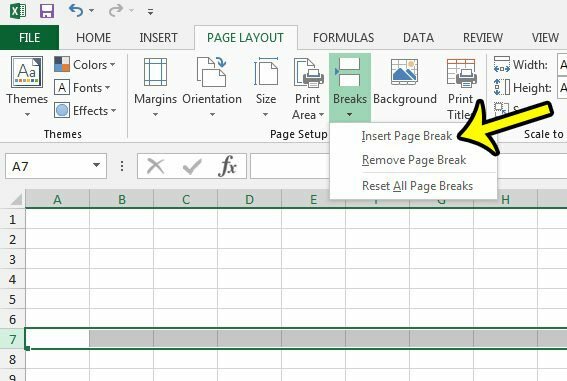 Even if you have configured Excel to print your rows and columns the way that you want, you may still need to include a page break to split up certain segments of data. You can accomplish this will the help of the Page Break tool. 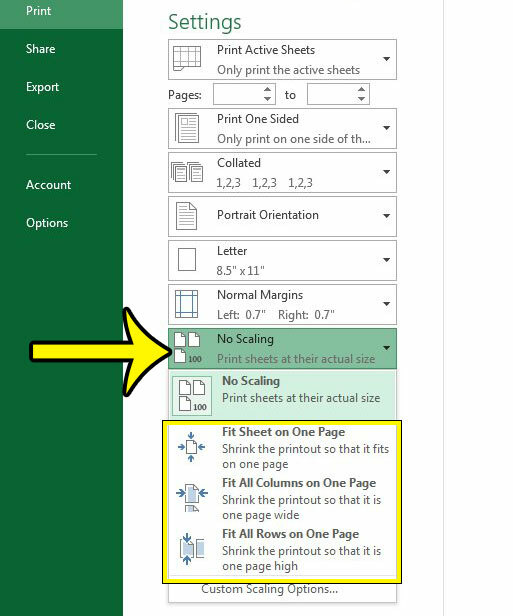 Note that manual page breaks will not adjust automatically if you add or remove rows above them, so you may need to go back and fix your page breaks if you find that they aren’t splitting your data properly after some edits to your spreadsheet. Note that if you select a row number, Excel will insert the page break above that row. 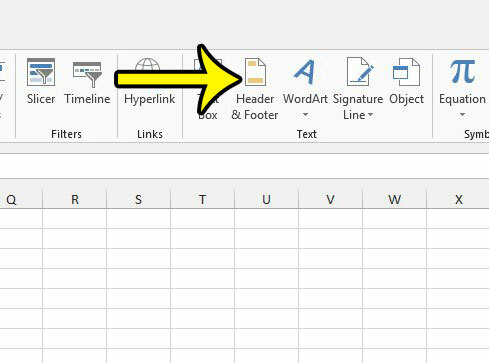 If you select a column letter, Excel will insert the page break to the left of that column. Click the row number at the left side of the sheet, or the column letter at the top of the sheet, before which you would like to insert the page break. Click the Breaks button in the Page Setup section, then click the Insert Page Break option. 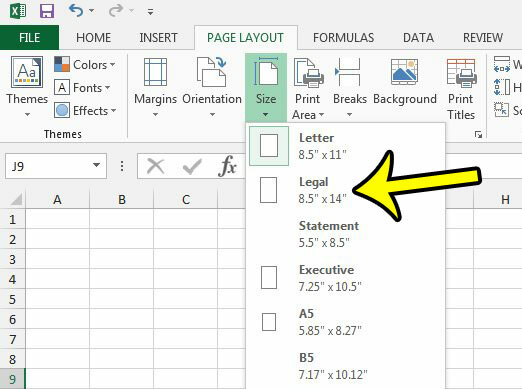 Your geographic location is used by Excel to determine which size paper it should print on by default. In some parts of the world this is the Letter size, while in others it might be A4. But there are many other paper sizes, and you might have a very large spreadsheet that you would prefer to print on Legal paper. Click the Size button in the Page Setup section, then choose your preferred page size. Occasionally you might have a spreadsheet that contains a lot of data, not all of which needs to be printed. But rather than duplicating that data to another spreadsheet, or hiding the unwanted rows or columns, you can manually specify the region of the spreadsheet that you wish to print. Click and hold on the top-left cell that you wish to print, then drag your mouse to select the rest of the desired print area. Click the Print Area button in the Page Setup section of the ribbon, then click the Set Print Area option. 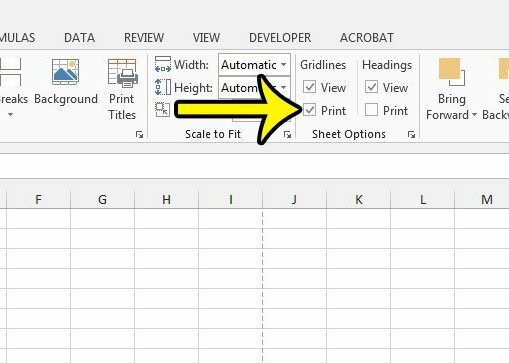 The options above should give you a solid foundation on which you can start making it a little easier to print files in Excel. You may still encounter scenarios where adjusting one, or many, of these options won’t help you to achieve your desired printing result. You may also still need to adjust the formatting within your cells (such as centering text across multiple cells) to truly maximize the effectiveness of your printed data, but this should point you in the right direction.